Time to roll up our sleeves and get to work, fellow writers! This letter has to do with the World’s Greatest Marksman: Hawkeye. First, the newest costume for the archer is great and a definite keeper, in my mind. The original wasn’t bad, but these days it looks really ridiculous. I would keep the hip quiver as well; as proved in the movie, Hawkeye can run out of arrows quickly. Now he’s not exactly anything. Hawkeye’s first slide into rampant flings began when he ‘dated’ the super-villainess Moonstone during the time when he believed that Mockingbird was dead (lousy choice of post dead wife date). Later he had a dallying ‘romance’ with the Wasp (she’s taken, people!) and after Disassembled he had a fling with the Scarlet Witch (who ‘killed’ him, twice). In the recent comics since Mockingbird finalized the divorce they started after Hawkeye discovered she had killed a man who abused her, he has ‘dated’ deaf vigilante-turned-heroine Echo (formerly Ronin) and, recently, Spider-Woman. Despite all this, when told by Cap that Mockingbird was on a list of international spies wanted dead, he rejoined the Avengers so fast it left his teammates practically speechless. Later, he was distraught when she received grievous injuries in battle, injuries that prompted Fury to give her an experimental serum to save her life. Hawkeye was virtually mum on the obvious dangers of the whole idea (a first for a character who regularly has more quips than arrows). I don’t know of any other time the character was so quiet about a dangerous situation regarding Mockingbird. In light of these instances regarding his ex-wife, why the yo-yo effect with Hawkeye’s romantic life? The character was never this fickle with his flirting in previous stories. It is also worth noting that this isn’t the only part of the character that is being batted around more harshly than a ping pong ball: once a staunch advocate of the old ‘do not kill’ superhero code, Hawkeye has become somewhat picky when he follows it these days. I think that it’s understandable that he would not willingly spare any Skrulls he was fighting, since one of the aliens successfully impersonated his ‘dead’ wife. Anybody would be killing mad after something like that. And his decision to permanently take down the Scarlet Witch not too long ago isn’t hard to understand, either, when one considers that she ‘killed’ him (twice). But this would hardly be a decision he wouldn’t wrestle with or have qualms about, something that doesn’t appear to have occurred when he made that choice. Yet when faced with a criminal such as Max Fury or the ‘new’ Ronin (Black Widow’s ex-husband), Barton suddenly balks at finishing the villain off. Isn’t that a little silly? If he’s willing to finish aliens and former teammates, why not villains who have earned their walking papers many times over, and for whom he had absolutely no feeling? 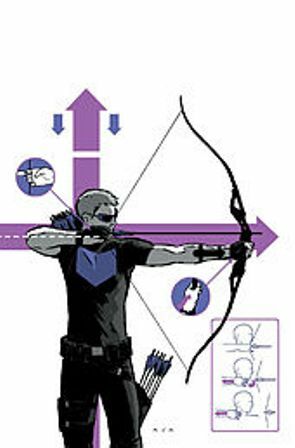 A brief overview of Hawkeye’s history is enough to make plenty of new readers shake their heads and say, “Ouch. What a hard story!” Over the last twenty years, Barton’s been all but shattered and rebuilt to the point where it’s amazing he’s still recognizable as the character he was in the sixties. It’s nice to see him getting along better with his teammates and stretching his wings as a commander of the team (or one of its auxiliaries) true; however, the rest of his character is practically a disgusting mosaic of the shards of his previous integrity. There’s little farther that ‘mainstream’ Hawkeye has to go before he becomes interchangeable with Ultimate Hawkeye (who is a near-total perversion of the character). The fact that Hawkeye’s been sent spinning off into one ‘romance’ after another seems, to one who looks hard at the list of circumstances under which he met these ladies, to be more like a search for his wife Bobbi Morse (Mockingbird) than the indecision of a berserk flirt. The pattern is something that she appears to be unaware of, but the threads of different stories point to Hawkeye desperately missing her all the same. With all due respect, why not make Mockingbird miss him back for a change? Moreover, why not make her act on that? I don’t see anything demeaning or wrong with the idea for either character. They were married in a whirlwind before; why not go about it a little more slowly this time around? Reed and Susan Richards have lasted this long. Why not give another superhero a shot at that life? Considering what he’s been through, Hawkeye’s definitely earned some happiness and needed respite. Heck, this type of story could open up all sorts of great avenues for both these characters and their teammates. After twenty years on the rack, fellow writers, I’d say that Hawkeye’s been beaten enough. This entry was posted in Marvel Comics' Characters and Stories and tagged abuse, archery, Black Widow/Natasha Romanoff, Bobbi Morse, Captain America/Steve Rogers, comics, flirting, Hawkeye/Clint Barton, Marvel, Marvel Comics' Characters and Stories, Mockingbird, Skrulls, Spider-Woman, superheroes, Trickshot/Barney Barton, Wasp/Janet Van Dyne on May 16, 2013 by The Mithril Guardian.